Over 1,000 gun grabbers gathered in Atlanta over the weekend for a left-wing “organizing” event put on by billionaire anti-gunner Michael Bloomberg. As the keynote speaker Friday night, Bloomberg railed against your rights, bragging about “landing punches” and that your Second Amendment rights are “on the ropes”. He concluded by saying “we’re getting stronger and stronger”. Bloomberg chose Atlanta for his gun control confab because the governor’s race here is his top race for 2018. He’s pledged $80 million to elect gun-grabbers like Radical Stacey Abrams, with capitol insiders reporting he will spend between $10-$15 million in Georgia to do so. That’s in addition to unlimited millions of dollars from George Soros, enviro-wacko Tom Steyer, and a $10 million pledge from San Francisco Socialist Susan Sandler. 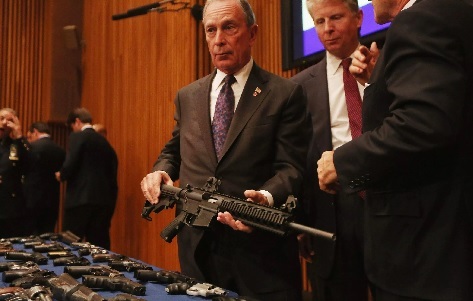 Bloomberg and his gang of wealthy left-wingers want one thing — elimination of your Second Amendment rights. That’s why Radical Stacey Abrams is their perfect candidate. On Saturday, Radical Stacey attacked your Second Amendment rights for 11 minutes (the audio of which has not been made available for obvious reasons). After being caught with her hand in the cookie jar by GGO members and supporters on Twitter, Radical Stacey ordered Watts to delete the tweet. But not before we captured this screen shot of it. The audio / video of her speech is still not released, as Radical Stacey and her staff are working with the Fake News media to cover their tracks. But we know the details of Radical Stacey’s gun control agenda. It’s ugly. *** Repeal of Georgia’s “Stand Your Ground” law, mandating Georgians would have a “duty to retreat” in the face of a violent attack. Radical Stacey’s strategy is for you to stay home in November. She wants to use the tens of millions of dollars from her billionaire buddies to turn out her socialist coalition, then ram gun control down your throat. The good news is, Georgia Gun Owners is leading the fight to protect your Second Amendment rights in Georgia from Radical Stacey’s gun control agenda. By strategically using resources supplied to us by our members (we don’t have any billionaire supporters cutting us checks), we’re able to target those who likely support the Second Amendment in Georgia. In fact, over the last seven days, between all of our social media accounts,we’ve exposed 2.1 million Georgians to Radical Stacey’s gun control agenda. But our work isn’t done yet, and that’s why I’m asking for your support today. Please click here to make a generous contribution right now to help us Stop Radical Stacey Abrams Gun Control Agenda. As you’ll see, there’s even options to give weekly or monthly, to help us sustain pressure and expose Georgians to Radical Stacey’s left-wing agenda. While you were going about your day over the weekend, the gun grabbers were working. Well-funded and working long hours. If you’re not talking to friends, family, and coworkers about the details of their agenda, they will win now and long term. Please take action today by forwarding this email and making a generous contribution. P.S. Click here to help Georgia Gun Owners keep this ad, Radical Stacey Abrams: Ban. Confiscate. Destroy, on the air!